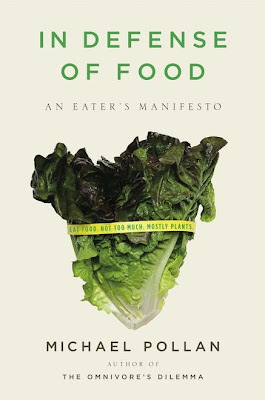 I finally picked up Michael Pollan’s In Defense of Food today. I'm glad I did, although it's preaching to the choir of eatdinner.org. The main argument of the book is set out in the first chapter: to reject "nutritionism" and the Food Industrial Complex in favor of real food and enjoyment of meals. This resonates with my message about eating dinner together as a family. Family is at the center of learning about food and at the center of enjoying it. Family dinners are the natural starting point to develop a better relationship to food for you and your family. "Culture .., at least when it comes to food, is really just a fancy word for mother." I love that. We've gotten too far away from our culture of family dinners. Not to blame mom yet again, but to encourage mom, or dad, to reclaim the right of family expert in what you should eat and what you should put on the family table.